From the discovery of the wheel to the worldwide web our thirst for innovation is what makes us human. 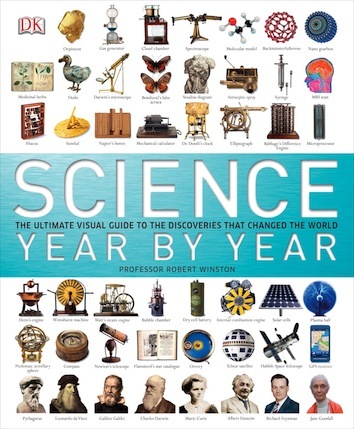 Science Year by Year takes a fascinating look at our heritage of invention and explores how science has shaped the past and how it may shape the future. Science Year by Year has a new discovery for everyone in the family, with global coverage of all major scientific advances. Groundbreaking thinkers such as Marie Curie, Albert Einstein and Charles Darwin are covered, with their discoveries clearly explained and situated in scientific history with illustrated timelines. Revolutionary innovations such as measuring time, gears and plastics are detailed alongside scientific artefacts such as navigation tools and flying machines. Science Year by Year is perfect for anyone interested in invention and innovation with exciting discoveries to be made by all. Hear Professor Winston talking about the book in this podcast.